Morocco believes in the potential for increased trade on the African continent and co-development in various sectors, said Monday evening in Marrakech, Moroccan Minister of Economy and Finance, Mohamed Benchaaboun. “We have already conducted major operations with several African countries in the areas of services, including financial services (banking and insurance), as well as telecommunications and public works,” Benchaaboun told a press briefing, held at the end of the first day of the ministerial segment of the 52nd Session of the Economic Commission for Africa’s (ECA) Conference of African Ministers of Finance, Planning and Economic Development (COM 2019) held in Marrakech. In this connection, he noted that the setting up of the African Continental Free Trade Area (AfCFTA) “will offer us an opportunity to accelerate what has been done with each country and will open a whole continent to exchanges in all directions and to co-development, which will enable growth to be raised to a higher level for the countries concerned”. 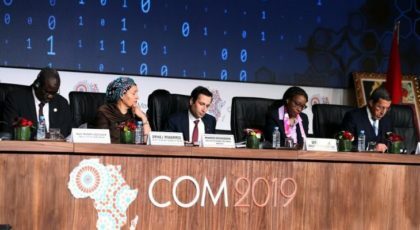 Benchaaboun also said that COM2019 is an opportunity to examine and highlight all the opportunities offered by digitalization and the use of new technologies to promote African economy. For her part, ECA Executive Secretary Vera Songwea said that the first day of the ministerial sessions had begun with discussions on the 2030 Sustainable Development Goals (SDGs) and the 2063 Agenda for Action. She expressed concern that overall, growth levels on the continent remain below what is needed to achieve the Sustainable Development Goals, noting that to achieve those Goals, Africa needs to triple its 2018 growth rate of 3.2 per cent. She said that the achievement of the 2030 SDGs requires $680 billion in funding and that the debate has shown that improving taxation, through broadening the base, could generate up to $480 billion. After noting that financial inclusion remains a challenge for many African countries, Ms. Songwea emphasized the social contract with the private sector, which is willing to contribute to the SDGs. She pointed out that Africa also needs increase in private investments and external trade, adding that the operationalization of the African Continental Free Trade Area (AfCFTA) will boost growth on the continent. According to her, the private sector accounts for over 80 per cent of total production, two thirds of total investment, and three fourths of lending within the economy. “The private sector also provides jobs for about 90 per cent of the employed working-age population,” she said. To enable the AfCFTA enter into force, it needs to be ratified by 22 of the 54 member countries of the African Union. So far 21 countries have ratified the AfCFTA, with Ethiopia being the latest and 15 countries have deposited their instruments of ratification. As a reminder, the ministers meeting in Marrakech this week is to allow conference delegates to build momentum towards greater continental integration by hashing out the policy details of the historic AfCFTA. COM2019 held March 20-26, under the theme “Fiscal Policy, Trade and the Private Sector in the Digital Age: A Strategy for Africa”, focused on the contributions of digital technology, both to the development of economic exchanges in Africa and the strengthening of national budget policies and the improvement of tax collection. Delegates also discussed how to align national policies to boost tax revenues, improve the management of public expenditure, tackle illicit financial flows and make private finance available for public projects. The meeting was attended by scores of officials and experts, including UN Deputy Secretary-General, Amina Mohamed, Vice-President of the United Nations Economic and Social Council (ECOSOC) and Morocco’s Permanent Representative to the United Nations, Ambassador Omar Hilale.